'Life Sized Psychoses' is the debut album from American duo The Fun Years and the first 'proper' album to come from the very promising Barge camp. Last year the label issued one of the finest compilations we'd heard in a while ('Innature') and they seem to be continuing the high bar of quality with this absolutely fabulous disc. 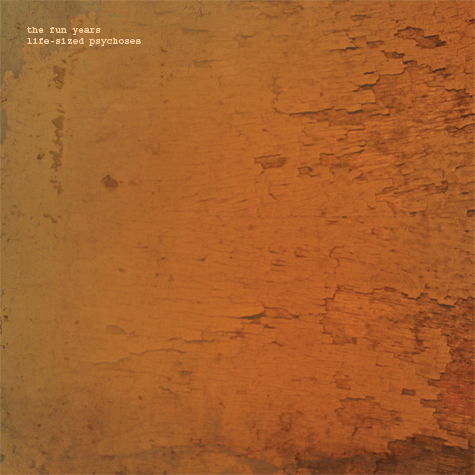 With one musician (Isaac Sparks) using turntables and effects, and the other (Ben Recht) on baritone guitar, the two create a hazy half-speed ambience which lies somewhere in limbo between Fennesz, The Gentlemen Losers, Machinefabriek, Vincent Gallo and Philip Jeck. That might be hard to bring to mind so let me help you out a bit - Isaac Sparks sounds like he's busy in the corner of a broken down old farmhouse, scraping motifs from old jazz and easy listening records as Ben Recht plays small riffs and improvisations over the top. Not that this is necessarily the recipe for success, but this duo have a deft understanding of each others' strengths and limitations and across fifty minutes never make a misstep. It's interesting actually to hear this kind of atmospheric, half-submerged music being produced in this manner, maybe the only comparison I can think of in this respect would be Mountains, who share a similar understanding for working with guitar and noisier elements. There's a sense that Recht is tempering these pieces, all hands on the controls as Sparks makes magic happen with his distinctive baritone guitar sound - there's just that feeling that although 'Life Sized Psychoses' might be a debut album, these guys could have been doing this forever. Warm and calming in some parts, icy and noise-laden in others, it's an album I know I will be playing over and over (I've had it for a few weeks now and it's not been far from the cd player). I want to say there's a narrative but that isn't what makes The Fun Years stand out, it's the way they avoid the trappings of ever being too academic or too laboured, and beneath all the trapped nostalgia of record loops and familiar motifs you get the feeling that this is the work of two musicians who are actually enjoying themselves. Utterly entrancing and totally beautiful - highly recommended.